The Dutch were the first white settlers to establish a community on Long Island in 1636. In celebration of the 300th anniversary of this settlement, many festivities were planned. 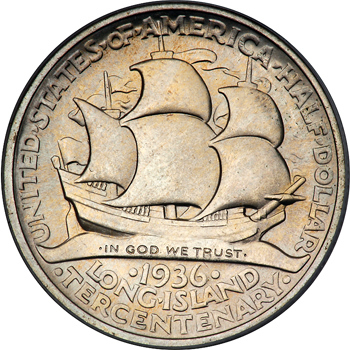 The Long Island Tercentenary Committee was formed to help plan these, as well as supervise the creation of a commemorative half dollar to help fund the celebrations. 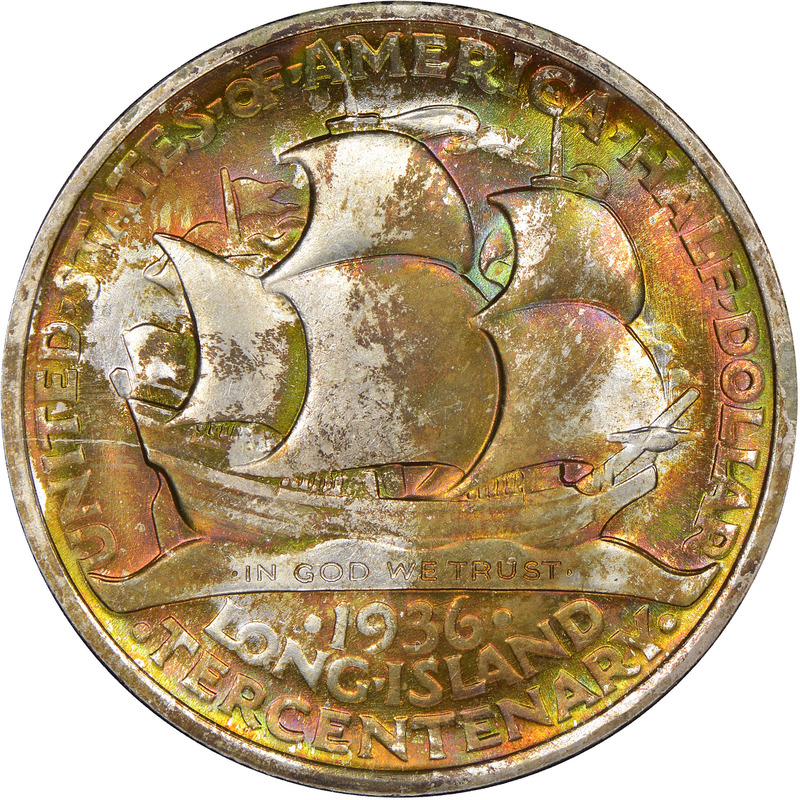 Unfortunately they acted too late, and while the festivities were planned for May of 1936, a bill authorizing the mintage of up to 100,000 Long Island half dollars wasn’t passed until May of that year. The Committee had planned ahead though, and was already in talks with an artist to create the designs. 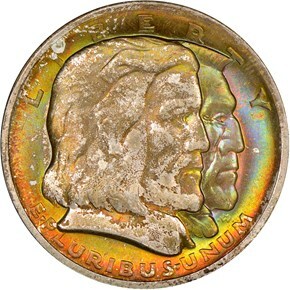 That artist was Howard Kenneth Weinman, the son of sculptor and medalist Adolph Alexander Weinman, who created the Mercury dime and Walking Liberty half dollar. 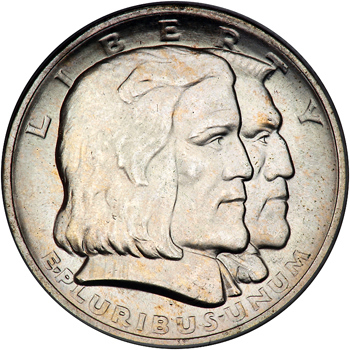 His obverse of the Long Island half dollar features a right-facing bust of a male Dutch colonist overlapping a similar bust of an Algonquin male. These portraits have been derisively described as two boxers because of their lantern jaws and prominent noses. Above the men in a peripheral arc is the legend LIBERTY, while the motto E PLURIBUS UNUM appears below. The reverse is dominated by a right-facing profile view of a 17th-century ship under full sail. It travels upon a scroll-like sea into which IN GOD WE TRUST has been incused. Written in a single, long semicircle around the upper periphery is UNITED STATES OF AMERICA HALF DOLLAR. Arranged compactly in three lines below the sea are the date 1936 and the title LONG ISLAND TERCENTENARY. 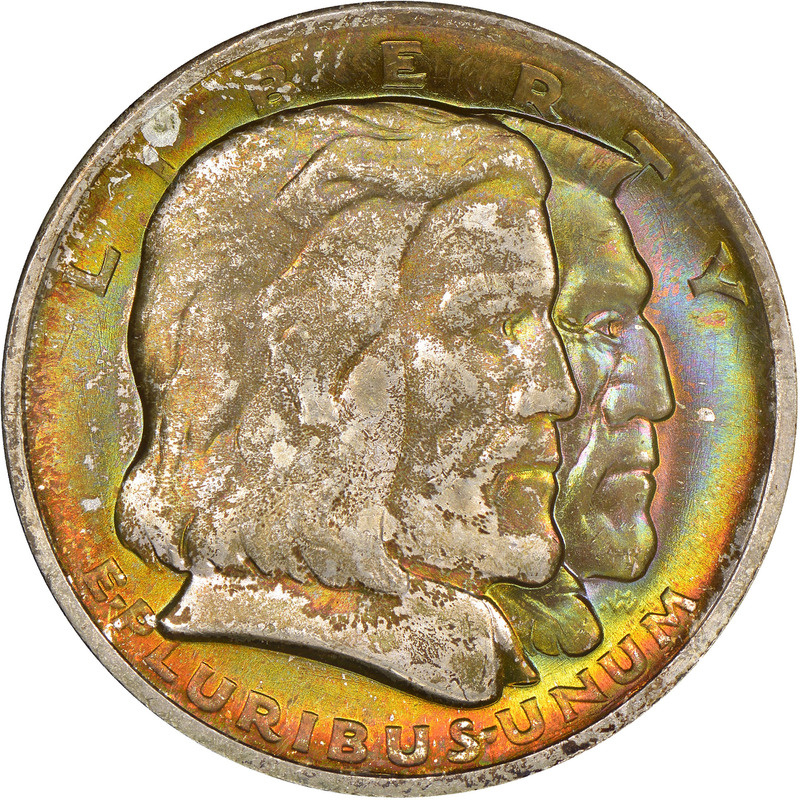 Despite the desire to have the coins ready for the festivities, the final models were not ready until June of 1936, at which point they were readily approved by the Commission of Fine Arts. Finally, a full 2 months after the Tercentenary celebrations had concluded, the entire mintage of 100,000 coins was struck in Philadelphia. Although arriving late, the coins sold quite well, and only 18,227 of the coins were returned the following year for melting, leaving a net mintage of 81,773 coins.